West began the much-anticipated talk by praising Trump's efforts in North Korea. 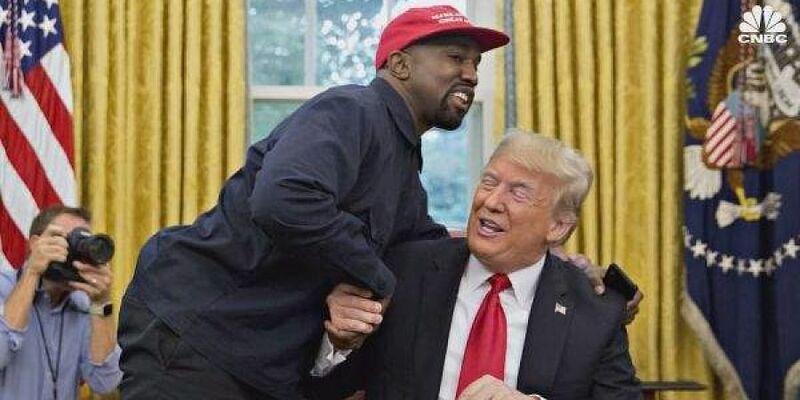 WASHINGTON: American rapper Kanye West met with President Donald Trump at the White House for lunch on Thursday (local time), and held a press conference in which the duo touched upon the 13th and Second amendments, North Korea, bringing manufacturing to the US, and ending stop-and-frisk in Chicago, among other issues. West began the much-anticipated talk by praising Trump's efforts in North Korea. "On day one you solved one of [Obama's] biggest troubles. We solved one of the biggest problems," Fox News quoted West, as saying. Furthermore, West discussed about not getting support from his Hollywood cohorts to back the Trump administration. "They tried to scare me to not wear this hat," West said, referring to the 'Make America Great Again' hat he wore during Thursday's meeting and on a recent episode of 'Saturday Night Live'. The 41-year-old went on to criticise the NBC sketch show and other liberal media members for their portrayal of the president. Speaking further in support of Trump, West said, "What I need 'SNL' and liberals to improve on is, if he don't look good, we don't look good. He has to be the freshest, the flyest, have the flyest planes. He has to look good. When we make everything in China and not America, we're cheating on our country." Talking about the 13th amendment, the rapper noted, "There's a lot of things that affect our mental health that put us into this trap door that is the 13th Amendment." Responding to a question put forth by the media on gun control, he asserted "Illegal guns are the problem, not legal guns, we have the right to bear arms." West, who is known to be an ardent supporter of Trump, reiterated his love for the president and even embraced the latter. Trump, in turn, complimented the rapper and said, "I tell you what, that was pretty impressive, that was quite something. He can speak for me any time he wants, he's a smart cookie, He gets it." He even went on to say that West could "very well be candidate material," to which the rapper responded, "Only after 2024." This was not West's first meeting with Trump. In December 2016, the Grammy Award winner visited the former Celebrity Apprentice host at Trump Tower in New York City, and discussed multiracial issues such as "bullying, supporting teachers, modernising curriculum and violence in Chicago." The 'I Love It' hitmaker has always been vocal about his support for Trump and has often faced flak for the same from his industry counterparts. During his appearance on the season premiere of 'Saturday Night Live', West was slammed by stars including Pete Davidson, Kenan Thompson and Chris Evans for his pro-Trump speech. Though his speech was not aired, the 41-year-old was lauded by Trump on Twitter.